I claimed a while back that I don’t like Pie Crust. Apparently I’ve been on a mission to change my own mind ever since. This brilliant creation has been percolating for quite some time – ever since I made the crunchy chocolatey wafers for my Vegan Chocolate Ice Cream Sandwiches as a matter of fact. The whole spelt flour won out for that recipe but the quinoa flour version was so unique and delicious in it’s own way that I knew it had to become a pie crust at some point. 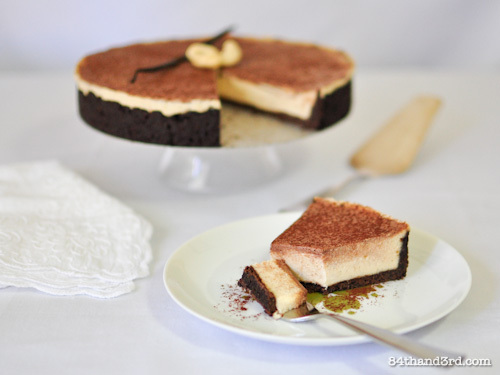 This crust is perfect for cheesecake – as witnessed in my Vegan Vanilla & Chocolate Cashew Cheesecake from earlier in the week – but it would make friends with just about anything else you want a chocolate crust for… a Franipane Pear Tart comes to mind, yum! I haven’t yet tried a version with quinoa flour and no cocoa, but you can bet that is next on the list. Do you have a favourite pie crust? Preheat oven to 180C [350F]. Sift all dry ingredients together. 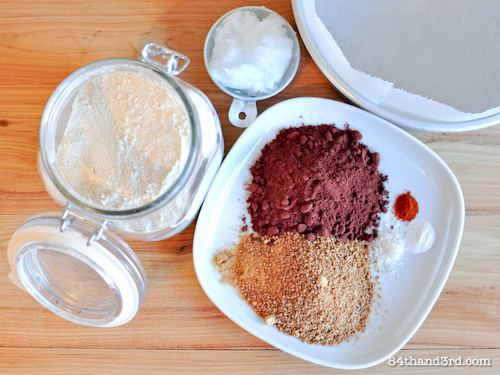 Add coconut oil and mash through with a fork until mixture resembles bread crumbs. Add almond milk one Tbsp at a time, stirring through with fork until mixture holds together into a little ball when pressed with your fingers – you may need all the milk, you may not. As quinoa flour has no gluten you can’t overwork this crust. Tip into pie plate or a Springform tin with baking paper lining the sides. Spread evenly and press flat on base and approximately 2 cm [1 inch] up sides with a flat bottom glass. Use damp fingers to smooth or patch any rough areas. Bake 12-15 minutes – baked crust will be soft but will firm on cooling. Cool completely if filling with a refrigerator-set filling like my Vegan Vanilla & Chocolate Cashew Cheesecake or fill and bake again as required for your recipe. I found that pressing the glass and turning it gently as lifting was the most successful technique for tamping it down evenly. thanks – I definitely like it better – it’s chocolate – ha! What a delicious alternative! Thanks for doing all the experimenting for me! I love that you can’t over-work it too. Does that mean it’s almost failproof? No worries, hard work tasting chocolate an all 😉 The only tricks are to get the coconut oil cut in quite fine or it will leave holes when it melts during baking and only add as much liquid as is needed! Looks sensational! I would so love to try some. I’m going to have to remember this one for my students at school! We are doing some GF baking this semester and pie crusts are always a massive challenge! I love the sound of this crust JJ. I love that you can’t over work it either. 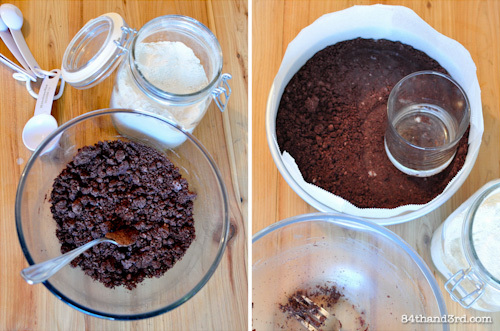 I love the crushed cookies pie crust among all, perhaps because they are the easiest to make. 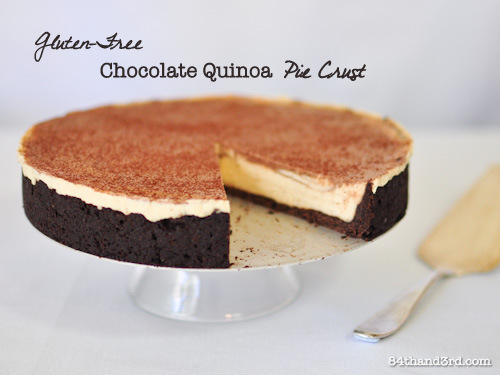 I am so excited to try this, almost like this pie, easy to make too. Thanks for testing it in your kitchen, I am more relaxed to try it in mine, I am sure this will be more than delicious. Looks heavenly! You are too sweet, thanks Melaina. AWEsome, I blogged about this recipe on my blog and links it back to here. Hope thats ok, looks good! I would love to make this but it has to be with stevia. What amount would you use? Thank you. What a fantastic recipe! I am absolutely enamored with this chocolate crust. And filled with that creamy cheesecake? Don’t think it could get much better then that! 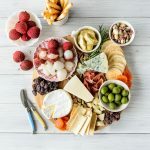 I would love for you to come share this recipe over at Thank Goodness It’s quinoa – a bi-weekly link party celebrating all things quinoa. I know our readers would adore this recipe! This looks so delicious! I’m having a hard time getting my hands on coconut oil, could i use normal butter instead?